The Church of England website has a large source of information available to help you with your wedding planning and this can be accessed by clicking here. The information below will answer some of your initial questions and is more specific to weddings at St Michael's. Can we get married at St Michaels? Yes! Provided either of you lives in the Parish of Wilmington, or has a past family connection with St Michael's, then there is no problem. If you live outside the parish and have no previous connection with the church, then it is not necessarily a problem, but you will need to discuss it with the vicar. Similarly if either of you has been previously married it is not necessarily an obstacle to being remarried in church, but you will need to explore the possibility with the vicar. Assuming all is well, before doing anything else the date and time of your wedding must be arranged. Please contact the Church Office (01322 288235) to discuss this. Please note that sadly in this day and age it is usually harder to book the reception than it is the church for your wedding! A non-returnable deposit of £25 is required on booking the wedding. We can accept payments by cash, cheque, debit/credit card or bank transfer. Your Banns of Marriage must be read in any Church of England Parish Church involved (even if you have a Roman Catholic or Free Church background). Banns cannot be read until three months before your wedding, and must be read in each Parish Church where the parties live. This may mean going to the other Vicar(s) involved and hearing the banns read on at least one of three successive Sundays. They do not have to be read out on the same day in each church. Your wedding cannot take place unless the Vicar who is marrying you has your Banns certificate beforehand. There is a charge for the certificate. Nearer the date of the wedding, say three months away, you must come in on a Tuesday evening to arrange the practical details. At present, an evening of marriage preparation with the vicar takes place approximately one month before the wedding and may be with another couple getting married around the same time as you. There will be a rehearsal (lasting thirty minutes) in the church to get the footwork right, in the week leading up to your wedding, on a mutually convenient evening. The bride and the groom are essential for this, but the best man, bridesmaids, parents and video operators are also welcome. Banns certificates from other churches and fees will be received at the end of the rehearsal. The cost of the wedding will be between £544 and £806 depending on whether you include an organist, the choir, bell ringing, video recording etc but this will be discussed with the vicar when you book your wedding. Payment can be made by cash, cheque, credit/debit card or bank transfer. Photographs may be taken coming in and going out of church and during the signing of the register. Official photographs only are permitted during the service, and no flash photography, and you are asked to make this clear to enthusiastic relatives! Video recording is permitted, provided operators strictly obey the guidelines about where to stand. Start by exploring the meaning of Christian marriage using the service book, before you think about hymns etc. The assumptions about the meaning of marriage in the service, and in the Bible, may be quite different from the views expressed in popular music, magazines or TV 'soaps'. With the pressure of today's world, if your marriage is to be a strong one, then you must let God into your plans, your hopes, and your fears too. Only Jesus Christ, by His Spirit living in us, can give us the strength to love and go on loving. It is usual to have two or three hymns at weddings. Choose hymns that your families and friends will know, and a list of suggestions is available. Familiar, cheerful hymns will set the tone of the whole wedding day. We have two hymn books that you may borrow covering most styles of music. The organist will play suitable voluntaries before and after the service, and during the signing of the register. If you want something out of the ordinary, you may need to provide your own sheet music if we do not have it, or as an alternative we are able to play CD's. Not essential, but you may wish to consider a printed order of service. 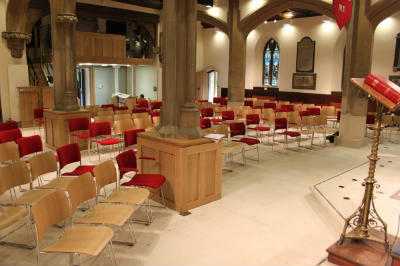 We will happily supply examples from other weddings held at St Michael's. It is probably a good idea to run these past the vicar before they are printed as mistakes are often made. You need to ensure sufficient copies are available for your guests plus an additional 10-12 for the minister, organist, choir, etc. Make sure that they are available in the church at least half an hour before the service begins. We offer our best wishes for your wedding and your future happiness.